A perfect fusion of style and comfort, these shoes for men by Hush Puppies are the latest favourites around. 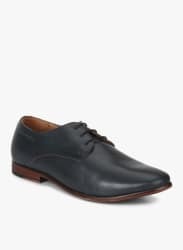 Navy blue in colour, these shoes feature leather upper and lining to ensure maximum ease for your feet, while the PU (polyurethane) outsole guarantees better traction. Furthermore, the classic shape makes them look exclusive and appealing!